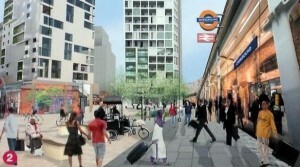 On the evidence of latest exhibition at York Library on the Winstanley/York regeneration plans, it is obvious that not only have our previous concerns and comments been completely ignored by Wandsworth Council, but also those of the regeneration area’s residents, who specifically wanted “fewer towers”. To be fair, the smallest of the three existing council block towers is to be demolished. 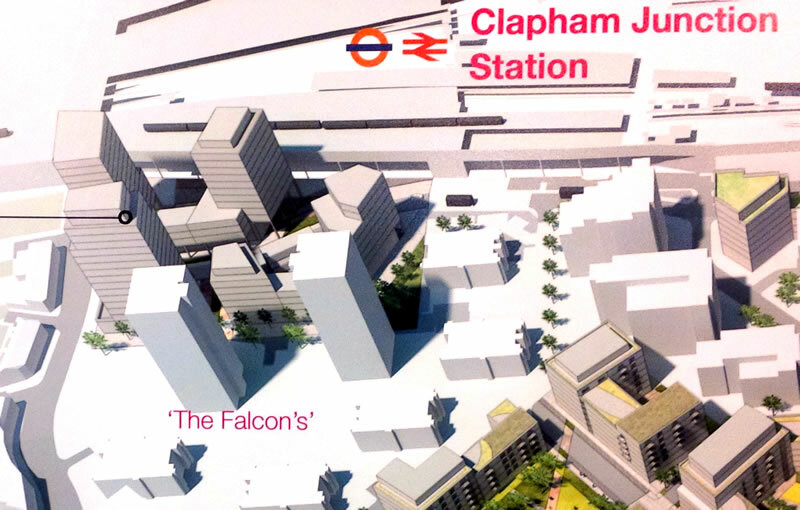 But a panel in the exhibition clearly shows two NEW tower blocks just beyond the railway bridge at the top of Falcon Road and adjoining Grant Road, on the so-called Bramlands site. Previous planning guidelines have indicated that new building height should be kept at around five or six storeys – the hotel development opposite CJ station was cut from 16 storeys to eight. But there is no longer ambiguity about the height of the new proposed towers. A council official at the exhibition admitted that they would be about the same height as the remaining towers – around 26 storeys. Apparently Network Rail plans to buy the Grant Road railway arches and develop them as chic restaurants, delis etc. The image on Page 4 of the latest Brightside appears to show this with what may possibly be the back of one of the proposed towers. 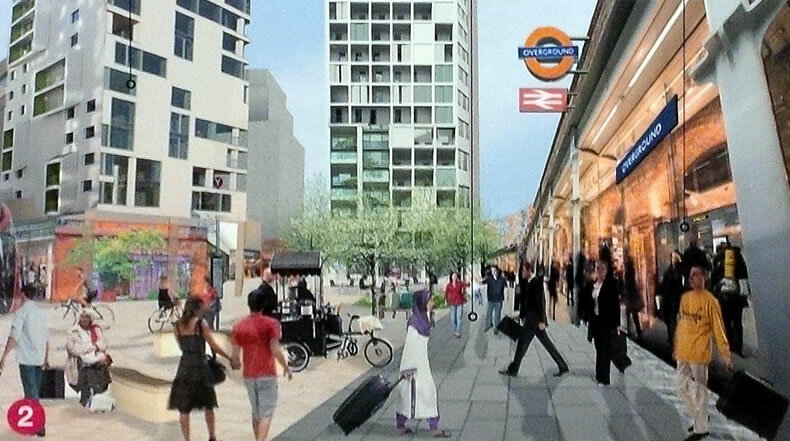 There was a suggestion during the exhibition that the council has a specific policy to develop this area as a “hub” with a “buzz” to cater for increased traffic from the Nine Elms development and the forthcoming Battersea Power Station Tube station. An official said that the first four floors or so of the towers would be commercial and above that one tower might “possibly be a hotel”. There might also, apparently, be interest from a dance company looking for studios. The towers would have to be tall to be financially attractive. The site is at present occupied by a bus terminal, a church, an old people’s home and a pub, the Peacock, currently being renovated. “I don’t really know why they’re doing that,” said an official. “We’d have to buy it and demolish it.” The council, it seems, already owns the old people’s home, so would have to build a new one (at what cost?) elsewhere. 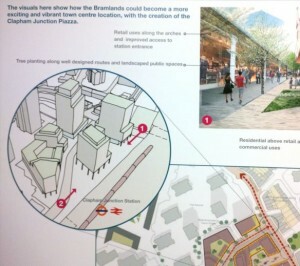 So the Bramlands plan is nothing to do with rehousing the estate residents. Nor has it been asked for by them. Indeed it will involve compulsory purchase of the pub, and possibly the church, and rehoming the old folk. Plus finding other space for the buses. It appears to be simply a cynical attempt by the council to piggy-back on the universally accepted necessity to regenerate the Winstanley and York Road estates. It is not (at least officially) developers proposing to build towers and having to go through a long planning procedure. It is the council, like a cat lying on its back so its tummy can be tickled, rolling over for developers. It would be unsurprising if (as was apparently the case with the 42-storey CJ monsters) the council has already been “talking to people” who are just waiting for it to green light the regeneration scheme before whacking in their plans for those tempting towers. And do you think the council will turn them down? Especially when they promise some few million in sweeteners to help repave Wandsworth or whatever. It is likely that a lot of estate residents did not see the exhibition, which ran for only three days with hours that meant many people would have been away at work. And in spite of our earlier request, the council did not extend the publicity for the exhibition to a wider area round Clapham Junction south of the railway bridge. A longer run with better publicity in Clapham Junction station, on St John’s Road and in the libraries would have given those who live and/or work in an area they care about and who would not be able to avoid the proposed towers, the chance to see the proposals and express their views. The image used in Brightside cannily shows only a couple of floors of the new building. 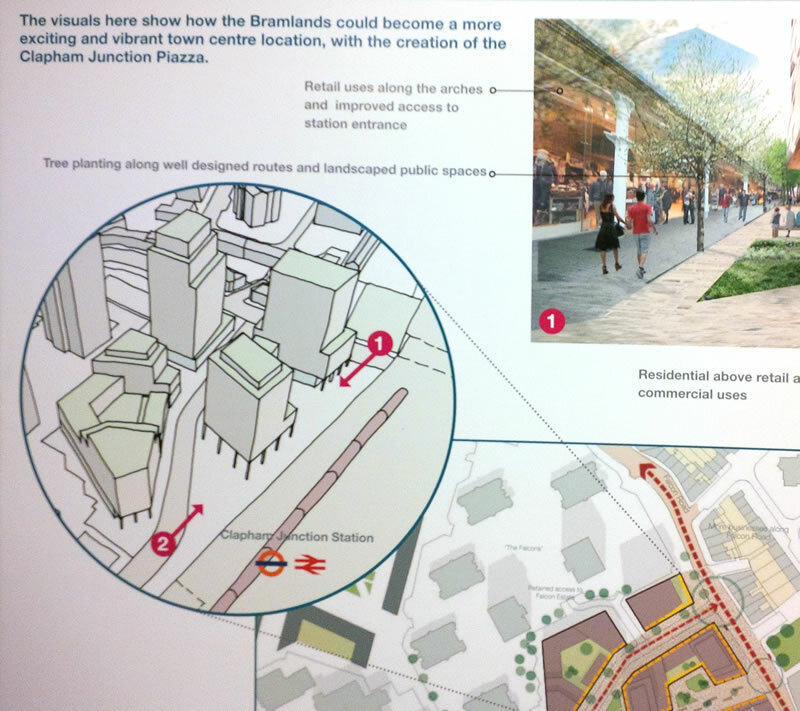 Thus the council considers the Bramlands area adjacent to the railway bridge not part of the Clapham Junction wider area for consultation purposes but very much, as its planning team said in 2013, a “town centre location” for “development to a higher density”. 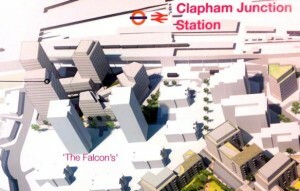 On this basis, the Clapham Junction Action Group would like to be involved in the redevelopment discussions. Therefore we have requested a meeting with the project team to discuss the plans. This entry was posted in Clapham Junction Action Group, Wandsworth Events, Winstanley&York Road and tagged Clapham Junction, events by Cyril Richert. Bookmark the permalink.